Has your roof or siding been damaged by a storm? Because of intense storm winds in Minneapolis Minnesota, roofs often sustain damage. Wind gusts often exceed 50-70 miles per hour during a storm, causing uprooting of trees and airborne branches. Storm winds in Minneapolis can result in devastating damages to your Minneapolis roof, such damaged shingles, flashings or even penetration from trees and flying debris. Roof Damage in Minneapolis from Storms? Call (651) 237-3491 For Immediate Assistance! A Minneapolis Hail Storms: A Roof's Worst Nightmare! Once a severe storm strikes and winds threaten, the updrafts of the wind can cause hail to form. Dirt and dust particles are carried upward, causing tiny balls of ice to form. When a Minneapolis hail storm hits, your roof and/or siding on your home can be effected. Hail damage in Minneapolis roofs can cause punctures, rips and tears. Hail can pelt your windows and your siding, leaving holes or punctures. Weather is unpredictable. Contractors should not be. Finding a Minneapolis roofing contractor to repair storm damage doesn't have to be difficult. The professional roofers here at Bolechowski Construction LLC have been securing homes and repairing roofs after storm damage in Minneapolis since 2008. When a storm damages your roof in Minneapolis with high winds and/or hail, you need a competent roofing contractor on your side. Let Bolechowski Construction LLC take care of your damaged roof. With over 11 years experience in repairing Minneapolis roofs after storm damage, Bolechowski Construction LLC has been providing reliable Minneapolis roof repair that you can count on. 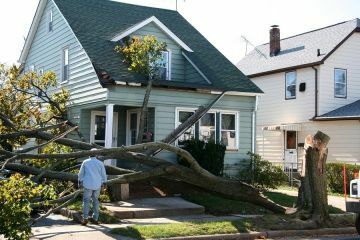 Our fast response time to a storm disaster in Minneapolis helps minimize any further damage to your property and helps keep the repair costs down. Our Minneapolis roofing team at Bolechowski Construction LLC will assess the damage and provide a written estimate for repairing your roof to its pre-damaged condition. Bolechowski Construction LLC has been providing exemplary roofing repairs for Minneapolis storm damaged properties for over 11 years. Call (651) 237-3491 for professional service and quick response! 5★★★★★ - "My house was built in 1910, North side of the roof was of unknown age and was worn out. The south side was my attempt to repair previous years damage. I kept looking for a good contractor for this as 2 others rejected the work. I called on Labor day, Nick arrived the next day, took a ladder off his truck and reviewed the damage. He recommended the insurance company as the roof was completely damaged and no wall flashing had ever been installed. As Minneapolis had a major storm in June 11th, The insurance adjuster needed to make an appointment to see the roof. Nick arrived and talked to the insurance company. As I never did this before, Nick explained the insurance process of filing a home claim. He knew that this was a rush job, he ordered supplies arrived on Wednesday, the crew arrived on Thursday of the same week. As nights are shorter, I turned my outside lights on for the crew to clean up every night. I am very happy the quality of work and the expediency of the job. Thanks again for the service"
5★★★★★ - "Nick worked with 2 insurance adjusters to replace my whole roof and some siding damaged by hail. He answered all my questions and returned my text messages quickly. I would use his company again." 5★★★★★ - "The owner was courteous and helped me more than I expected. Not only was he knowledgeable, he gave me great advice for continuous care. The job was completed on time, well put together, and the old material was as if it had never been replaced." insurance process, and planning process. He met with the insurance adjuster and kept me updated the entire job. They got the job done in a day, left it cleaner then they found it, very responsive and reliable. Highly recommended." 5★★★★★ - "We contacted Bolechowski Construction to replace our roof after storm damage. Nick worked with us to get the exact roof that we had prior to the storm. He was pleasant and knowledgeable and completed the job within our time frame. All debris was cleaned up and hauled away promptly. We also hired him to do some additional cosmetic work on the house and he did a great job matching siding that has long needed replacement. We will not hesitate to contact Nick when we are ready for our next project." 5★★★★★ - "We hired Nick and his company to do a complete remodel of our bathroom. Nick and his crew were great to work with. Communication was fantastic, they really listened to what we were trying to do. Nick never wavered from the budgeted estimate and finished ahead of time. We will be using Bolechowski Construction again in the future." 5★★★★★ - "We've been working with Nick from Bolechowski Construction for a couple of years now. He is an honest, reliable contractor and we definitely recommend his services!" 5 ★★★★★ - "Nick and his great crew replaced all our windows this summer. Nick was very helpful in the planning of the project and very flexible working around some issues we ran into. He got the job done quick and correctly, he was very responsive to our questions and concerns throughout the project. We couldn't be happier about our new windows. They look great! I also had Nick install some gutters. Bolechowski Construction was a great company to work with, and we plan to use them again in the near future!!" 5★★★★★ - "Nick remodeled our main bathroom and also installed two new windows upstairs. He was great to work with. The whole project was completed within the space of just a couple days. This included a new tile floor and installing a new custom window over the tub besides the two other windows. He was easy to work with and offered his advice when we asked for it. He always told us when he was going to arrive and actually arrived at that time. We received a professional estimate beforehand and his price was very reasonable. He cleaned up after the work was complete. Our bathroom looks fabulous, we just love it. When we are ready to do so, we will be lining him up for our next remodeling project in the kitchen." 5★★★★★ - "Nick was great to work with. He Completed the project in time as planned and worked with me on all my questions. He worked around my schedule and the backsplash, sink/faucet, stovetop looks great! Thanks again Nick, I look forward to working with you on future projects." 5★★★★★ - "In early 2015 Bolechowski Construction added a dormer to our 1.5 story home, remodeling an interior bedroom, and adding a finished 1.5 bath to the space. I was nervous about undertaking such a big project, after having issues with other contractors in the past. However, we are now THRILLED with the space and wish we would have found Bolechowski Construction sooner. Their bid was the most reasonable of the 3 we got, and the entire project was managed very well. Nick was easy to communicate with, stayed right on track with the projected timeline, offered valuable and creative insights, and made dealing with inspectors an ease. We had 1/2 the roof torn off, new walls, new floors, plumbing rerouted, an entire new bath, and no issues. His crew was respectful and nice, as we lived through the construction, and Nick and his team made the process as painless as possible. The end result was affordable and created an amazing new space in our home. I highly recommend using them to my friends and family." 5★★★★★ - "My husband and I had been waiting to add an overhang over our front door for a year now. Finally saving up the money to do it, we contact Nick and Bolechowski Construction. Nick was great at listening to what we wanted and even better at executing. We showed him a couple of pictures of overhangs that we liked and he was able to re-create it to fit and match our home! The whole process took less than 2 weeks. The addition of the overhang gives our house dimension and looks like it was built with the house. Wonderful experience and we will use Bolechowski Construction again when the next house project comes up!" 5★★★★★ - "Based on a friend's recommendation, I hired Bolechowski Construction to remodel my bathroom. Their price and speedy timeline were important considerations, especially since I only have one bathroom in my home. Although they encountered a problem when installing the glass block window, they figured out a solution and I am very happy with the end result. In addition to the new window, the project included some new walls, new floor and wall tile, new plumbing, and the installation of a new tub and toilet. The project went well and they finished within the promised timeframe and budget." 5★★★★★ - "We hired Bolechowski Construction to finish our basement. We originally quoted our basement with a larger corporate business but the large corporate business was way too focused on putting in features in our basement that were too upscale that it would not match the rest of the house (and it was almost twice the cost as Bolechowski). Nick came out and gave us a general quote and said he could build it out to our specs. We were a bit nervous at first because the large corporate company had blueprints and material lists, etc. so it was easier to tell what we were getting. After a couple of sit-down discussions with Nick we decided to do the project with him using our rough sketch as a starting point. Nick allowed us to make weekly installments for the project which helped us feel comfortable that we would get what we wanted and it took away the fear that someone would take our money and run. The project went very well and we are very happy with our basement. The project did take a few weeks longer than we expected, but the issues were mostly related to waiting on delivery of custom cabinetry. Nick was always accessable through emails, texts, and phone calls so we were always informed about what was going on. There were a couple of things that popped up during the project that cost extra money but Nick was willing to negotiate a fair price for the unexpected costs. My wife and I are happy with our new living space!" 5★★★★★ - "I hired Nick from Bolechowski Construction to do a complete renovation of my upstairs bathroom and a partial reno on the downstairs bath. Switching contractors due to the normal guy I use retiring was a bit nerve racking, but the entire process was very smooth, starting with a review of the contract and my expectations. During the construction Nick was in constant communication and issues that arose including back-ordered tile and tubs not fitting as they should were promptly handled and resolved. Nick and his team were also great about working around 2 kids and keeping things clean and safe during their time in the house. The end results to both bathrooms were great and there were no hidden costs as the project drew to a close. I would definitely recommend this company as I was pleased with the final product and love the new bathrooms!" 5★★★★★ - "My family used Bolecheski Construction and really appreciated the professionalism of Nick and his staff. They walked over everything thoroughly with my wife and I to ensure we were pleased. Very please at his work and would recommend him to all family an friends."